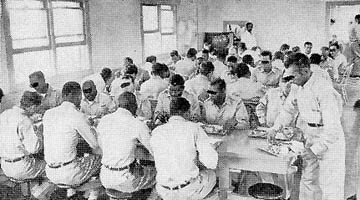 The combined kitchen and mess hall served as the common dining facility for the Nike personnel stationed on Hart Island. When the Army abandoned the site, the DOC retained the structure which presently serves inmates brought to the island for burial and landscaping duties. 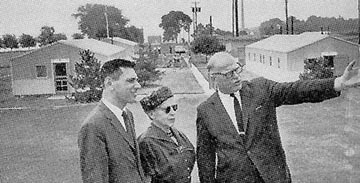 To serve the needs of the Army troops stationed on Hart Island, the Nike facility also contained prefabricated "Utica-style" barracks and a combined kitchen and mess hall which served as a common dining facility. Author and historian Donald E. Bender is the principal of Bender Associates Historical Consultants. A recognized authority on Cold War air defense facilities, his activities have been featured in major media including the New York Times, WNBC-TV and National Public Radio. He maintains an extensive web site on Nike Missiles and Missile Sites. He can be reached via e-mail at bender@alpha.fdu.edu or by telephone at (973) 535-8362. The entire base was enclosed behind steel cyclone type fences topped barbed wire and access was strictly controlled by armed sentries. Large warning signs, posted at regular intervals, helped to discourage curious boaters from attempting to visit the island. All of the color photographs on this page were taken by Donald E. Bender during a brief official visit to Hart Island in April 2000. Copyright 2000 by Donald E. Bender. Text & color images. All Rights Reserved. The base also contained a Generator Building featuring diesel generators that supplied electrical power to the missile site whenever an alert was called. Internal power was used during practice alerts in order to simulate actual wartime conditions during which the region's electrical power grid might have become unstable due to bomb damage, the electromagnetic effects of nuclear detonations or deliberate sabotage. 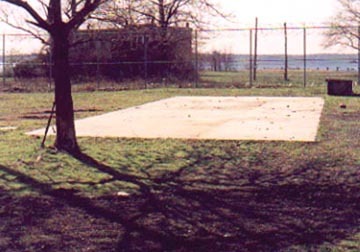 The Hart Island missile site and all of its "sister" sites within the New York metropolitan area were initially equipped with the first-generation Nike missile system known as Nike Ajax. 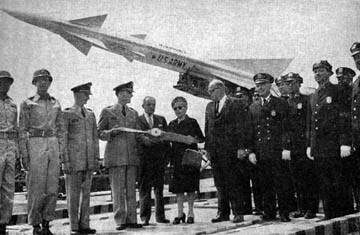 Beginning in 1958, however, select Nike installations within the region were upgraded to fire a new, second-generation Nike missile known as the Nike Hercules. The Nike Hercules missile represented a vast improvement over the Nike Ajax. It offered a higher maximum speed, improved altitude capabilities, and roughly three times the range of its predecessor. More significantly, the Nike Hercules could be armed with a powerful, defensive nuclear warhead enabling a single Hercules missile to destroy a formation of several attacking aircraft. Several concrete foundation slabs supported prefabricated Butler-style barracks erected at this site. The barracks were used by the DOC for several years after the Army left the site. They were eventually removed, leaving only a series of concrete slabs to mark their locations. The greatly enhanced capabilities of the Nike Hercules system meant that fewer missile sites were required to defend the New York metropolitan area. Only 10 of the original 19 Nike missile sites in the region were upgraded to use the Army's new missile system. Some of the sites equipped with the new Hercules missiles remained in operation through 1974. By contrast, all of the unmodified Nike Ajax equipped sites in the region were inactivated by 1963. Probably due to its close proximity to the center of the New York Defense Area, Nike site NY-15 did not receive the new Nike Hercules missile system. It continued to operate its Nike Ajax missiles until it was finally inactivated during 1961. Battery "D" of the Army's 1st Battalion, 55th Artillery - the second and final unit to command this site - held its final inactivation ceremonies on June 30, 1961. During the ceremonies, the battery commander presented New York City Department of Correction Commissioner Anna M. Kross with a wooden propeller from a Radio Controlled Aerial Target or "RCAT." Also attending the inactivation ceremonies on Hart Island that day were the Deputy Correction Commissioner and the Hart Island Warden. Following the deactivation of the Army's Nike facility, the New York City Department of Correction acquired the former Hart Island missile installation. On July 23, 1962, the DOC opened a new facility for the "housing of family court cases and traffic offenders". Commissioner Anna M. Kross presided over the opening. 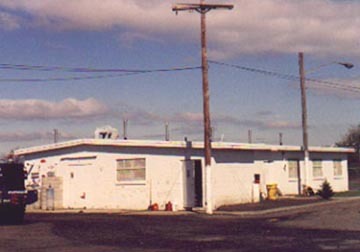 The Army's prefabricated, steel Utica-style barracks, left behind after the site was closed, provided accommodations for the island's new temporary residents. The Army's diesel-powered electrical generation facility remained in use and was operated for the DOC by inmates residing on the island. Numerous relics of the Army's Hart Island missile launching facility remain visible today. Close to the island's northern end, the exterior surfaces of the two underground missile magazines are easily discerned. The adjacent fueling and warheading area remains intact, although its protective earthen berms are now heavily overgrown with vegetation. A rusted crane designed to lift and move missiles now stands idle near the center of this facility. "On July 23, 1962, the abandoned US Army Nike Missile Base located at this institution was opened as a facility for the housing of Family Court cases and traffic offenders . . . Here 105 first offender traffic and family commitments are satisfactorily and healthfully housed in the metal Utica-type barracks buildings abanonded by the army . . .
"Inmates housed therein do all sanitation and other minor maintenance requirements, along with the establishment of inmate fire watchers on a 24-hour basis. Inmates are also assigned to the disel-powered generator plant where they have successfully mantained efficient and continual operation of all power plant facilities." Further south, foundation remnants of the demolished Missile Assembly and Test Building can be distinguished. Several concrete slab foundations, created to support the Army's prefabricated barracks, are located nearby. Although the barracks were eventually removed by the Department of Corrections, the Army's combined kitchen and mess hall remains intact. It currently serves inmates from the Riker's Island correctional facility who have volunteered to perform burial or landscaping activities on Hart Island. On the island's western shore, the pier complex constructed by the Army to move men, missiles and supplies to and from the Nike installation lies abandoned and unused. Today, the Cold War is but a memory. New Yorkers no longer live in profound fear of a nuclear Armageddon. The tense and often frightening circumstances of that era which brought the Army and its Nike missiles to Hart Island are long past. A monument erected by inmates on the island during 1948 stands close to the abandoned missile site. Inscribed on its northern facade is a single word: PEACE. How times have changed!